Franklin Graham has written several best-selling books, including The Name (2002), Living Beyond the Limits (1998), and his autobiography, Rebel With a Cause (1995). His first book was Bob Pierce: This One Thing I Do (with Jeanette Lockerbie in 1983), the story of the journalist, evangelist, and international relief worker who founded Samaritan's Purse. 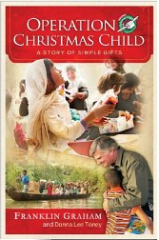 His books also include the devotional All for Jesus (with Ross Rhoads in 2003); the children's book A Wing and a Prayer (2005); Billy Graham in Quotes (with Donna Lee Toney in 2011); The Sower (with Donna Lee Toney in 2012); Operation Christmas Child: A Story of Simple Gifts (with Donna Lee Toney in 2013); and Rocks, Dirty Birds, and Briars (with Donna Lee Toney in 2016). For most of Franklin Graham’s life, walking in his daddy’s footsteps was the farthest thing from his mind. In fact, it wasn’t until the age of twenty-two that he was “finally comfortable being Graham.” Rebel With A Cause is Franklin’s account of his early struggles and his late triumphs. Throughout history, Jesus' parable of the sower has served as a beautiful word picture of the Christian life. And in modern times, no one has communicated this message more fervently than Billy Graham. His son Franklin is now carrying the torch of this vital message and has created a poignant, 31-day devotional to remind Christians what our purpose is in this life. This book gives readers step- by-step instruction and daily inspiration for following in Jesus' footsteps. Here is a larger-than-life portrait of a man whose ministry began with compassion for one child in China and ended up with a program to rescue countless thousands around the world. Bob Pierce: This One Thing I Do is the story of Robert Willard Pierce, outstanding evangelical humanitarian - founder of World Vision and Samaritan's Purse, co-founder of Youth for Christ - a man whose constant prayer was that his heart be broken by the thingsthat break the heart of God. Instead of joy and fulfillment, many people feel exhausted, depressed, and empty inside. Sometimes they wonder, Is this all life has to offer? Franklin Graham says we experience this feeling because we're out of sync with God. In Living Beyond the Limits, he helps readers discover that God's principles and promises are essential for a fulfilling life. This is a practical, powerful book of inspiring stories about people who have put their faith into action in the most adverse circumstances. Their stories will amaze and encourage readers to face their fears, surrender them to God, and watch Him take them beyond what they could ever have imagined. Before offering a prayer at the inauguration of President George W. Bush, Franklin Graham was asked by a fellow participant if he intended to pray in the name of Jesus Christ. Graham assured him that he would and encouraged this pastor to do the same. As Graham reminded him, "That's the only thing we've got." In days of religious confusion and cultural relativism, Franklin reminds us that there are absolutes in the kingdom of God.The Name explains the significance of names in the Hebrew culture, centering on the meaningfulness of the name Jesus. Chapters focus on the different aspects of power in the Lord's name, such as "Healing in the Name" and "Salvation in the Name." Through vivid description and sound biblical teaching, Franklin Graham and Ross Rhoads make Scripture passages come alive in this devotional, causing the reader to not only hear the Word but to experience it. In a compassionate yet uncompromising approach, All for Jesus offers insights on a variety of topics, including God's will, forgiveness, prayer, the Holy Spirit, God's character, worship, and serving God. Ultimately, this devotional challenges us all to move beyond reluctance and fear to increase our faith and become fully committed disciples of Christ. According to Franklin Graham, "My father has always prayed that his words would reflect God's standard of truth as the basis to claim, 'I have given them Your word' (John 17:14). In this book, I believe you will see that he has faithfully spoken God's Word that quenches the thirst of those seeking to draw from the wellsprings of Life. It is highly meaningful to see these statements now collected in one volume." Drawn from an unparalleled collection of both personal and published works, Billy Graham provides input on more than 100 topics, such as suffering, joy, money, addictions, peace, and more. It was a simple idea that became the worldwide ministry of Operation Christmas Child—to minister to children in war-torn and famine-stricken countries. In just two decades it has inspired everyday people to provide more than 100 million gift-filled shoeboxes to needy children in 130 countries. This beautiful book weaves the moving, God-saturated story of the ministry’s beginning with the soul-stirring, Christ exalting stories of lives that have been forever changed by a simple shoebox. Operation Christmas Child is filled with full-color photos of children whose smiles help tell what is a thoroughly hopeful story. Samaritan's Purse President Franklin Graham provides insight as the incredible stories of life transformation are told. In Matthew 13, Jesus used the parable of the sower to foretell all the ways the world would try to reject God's Word. Rocks will be thrown at the righteous, dirty birds will try to steal your peace and assurance, and briars will try to choke out the clear truth with noise and confusion. In today’s world, the rocks are hardened hearts that have turned from God, the dirty birds are enemies of the Gospel promoting negative influences, and the briars are the media channels seeking to distract and alarm. In this call to action, Franklin Graham helps us see the importance of speaking God’s truth in a hostile environment.